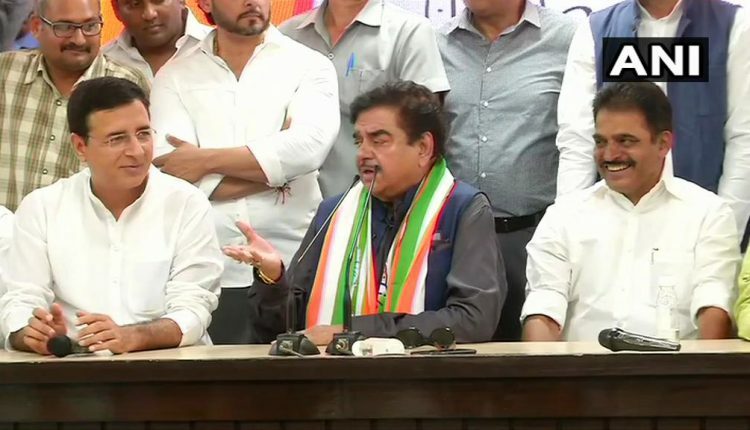 New Delhi: The dissident Bharatiya Janata Party (BJP) leader and Lok Sabha MP Shatrughan Sinha officially joined the Congress here on Saturday. The 72-year-old actor-turned-politician joined the grand old party in the presence of Congress General Secretary KC Venugopal and Randeep Surjewala here on the Sansthapna Diwas or Foundation Day of his outgoing party, the BJP. Briefing media persons, Sinha slammed Prime Minister Narendra Modi and BJP chief Amit Shah for their alleged autocracy in the functioning of BJP and the government. “In the one-man show, two-men army, everything happens from Prime Minister’s Office… the ministers can’t work freely anyway,” Sinha said. “We have seen how democracy turned into autocracy”. Earlier on the day, Sinha tweeted, “ I’m hopeful that the Grand Old National Party which I’m stepping into, will provide me with opportunities to serve our people, society and nation in terms of unity, prosperity, progress, development, and glory. This is a party of great nation builders and luminaries like mahatma Gandhi, Nehru, Patel and many others. “Under the present President of Congress the very dynamic, able, tried, tested and successful face of today and tomorrow’s India, Rahul Gandhi, I hope, wish and pray that I’m heading into a better direction,” he wrote in Twitter. Congress sources said, Sinha is likely to contest from Bihar’s Patna Sahib Constituency, from where he had won last two terms (2009–2014, 2014–19).